Subscriptions. The Bulletin is distributed free to faculty, staff and students. Others may subscribe to the Bulletin for $30 for the academic year (half price for current Princeton parents and people over 65). Send a check to Office of Communications, Princeton University, 22 Chambers St., Suite 201, Princeton, NJ 08542. Deadlines. In general, the copy deadline for each issue is the Friday 10 days in advance of the Monday cover date. The deadline for the Bulletin that covers Nov. 1-7 is Friday, Oct. 22. A complete publication schedule is available at <deadlines> or by calling (609) 258-3601. Princeton NJ -- A fellow at a research institute in Princeton receives a cream-colored envelope in her mailbox. Inside is a ticket for a concert of chamber music at the University's Richardson Auditorium. There is no note and no explanation for this gift. 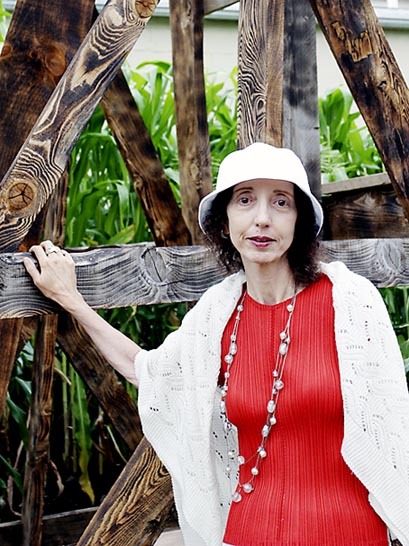 Author Joyce Carol Oates, shown here at the structure built in her honor at the Writers Block in downtown Princeton, uses the borough and campus as a setting for her novel. The young woman, Lara Quade, speculates that her anonymous donor will be sitting in the seat next to hers at the concert. When she meets the man who arrives to occupy that seat, her quiet life takes a series of dramatic, unexpected turns. Princeton is the setting for the novel ''Take Me, Take Me With You'' (Ecco) published under the name Lauren Kelly, who is described on the book jacket as ''the pseudonym of a bestselling and award-winning author.'' The novel takes the reader on a harrowing journey as Lara unravels the mysteries of her tragic childhood. It is a tale full of plot twists and devastating secrets that keep the reader in a state of suspense. The author behind the pseudonym is Joyce Carol Oates, the Roger Berlind Distinguished Professor of the Humanities, who has created a new persona to expand her fiction writing in another direction. Oates is a formidable figure in American fiction. Her evocative prose has garnered the National Book Award, the PEN/Malamud Award honoring excellence in the art of the short story and the O. Henry Prize for continued achievement in the short story, among others. She has written 48 novels and 27 short story collections, as well as 10 collections of non-fiction, eight books of poetry and five children's books. Oates wanted to introduce a new pseudonym because ''she felt this was a different voice that didn't fit in with either Joyce Carol Oates or Rosamond Smith,'' Halpern said. ''She was experimenting with a slightly different genre, so we thought it would be interesting to launch a new writer.'' The publisher didn't conceal the author's true identity, but didn't broadcast it either. Indeed, the book's main character sits in her seat at Richardson wearing a green velvet dress purchased at a secondhand store off Nassau Street. She strolls past Clio and Whig halls, borrows books from Firestone Library and goes to her office on Washington Road. Her home, on the fictional Charter Street, is in a ''shabbily elegant old Victorian house'' whose residents are all associated with the University. Lara has a two-year fellowship at the institute, where she does research on early automata, particularly mechanized dolls. To write about Lara's interest in 18th-century French androids and other mechanical dolls, Oates consulted ''Edison's Eve: A Magical History of the Quest for Mechanical Life,'' which was written by Gaby Wood, whose father is Michael Wood, the Charles Straut Class of 1923 Professor of English. Two Princeton students delve into the mysteries of a 15th-century text famous for its hypnotic powers over those who study it. As they unravel the meaning of the ancient book, they discover a secret code leading to buried treasure, and more. Caldwell is a member of Princeton's class of 1998. A professor is found dead in the burnt-out ruins of the Afro-American studies building at Princeton, and a Harvard economics professor, convinced that his death was no accident, resolves to find out who murdered him. The author's husband is Lawrence Otis Graham, a 1983 Princeton alumnus. Melissa Faircloth, Princeton's first female president, is discovered dead in her private office closet. Shady colleagues and her hard-drinking ex-husband are just two of the possible suspects. Waldron worked at the University’s Office of Communications from 1978 to 1989. Oates was inspired by her surroundings when writing the book, but she finds it difficult to pinpoint the precise source for its plot. When conceiving of a new novel, Oates pictures the story in theatrical terms. Oates also recently released a short story collection titled ''I Am No One You Know,'' a collection of tales about life in America; and a novel, ''The Falls,'' a haunting story about the powerful spell Niagara Falls casts on two generations of a family. Both were published under her real name. Oates is scheduled to teach two workshops in prose fiction this fall, and she was happily anticipating her time in the classroom.